Update, February 24: Ok, folks, it looks like things are gathering serious momentum. Telegram says it saw 5 million downloads on Sunday, and it is top of the App Store in nearly 50 countries worldwide. Anayltics shows how the app has become hugely popular, although that rise has also led pundits to take a closer look at its security and suggest that it isn’t quite what the team claims it is. There doesn’t appear to be drones of WhatsApp users running for a rival service following the messaging app’s $19 billion acquisition by Facebook. Telegram — a security-focused messenger from Russia — looks to have netted the bulk of the migrants after announcing a record 500,000 new sign-ups after the deal, while other apps enjoying spikes include Threema, which attracted 200,000 new users. Launched last year, Telegram is a messaging client for iOS and Android that is very WhatsApp-like with a basic user interface and focus on sending messages quickly and efficiently. Like its big rival, Telegram doesn’t serve ads, but there are key differences between the two. WhatsApp charges users $1 per year after an initial 12 months for free, but Telegram is free to use forever. Telegram’s core appeal is a strong focus on security, an area where WhatsApp is less steady. It is open source and based on a custom data protocol, which has led to a roster of unofficial apps being developed and offered by enthusiasts. Founders Nikolai and Pavel Durov launched Russian social network VK, and are focused on making Telegram a non-profit organization that is solely focused on serving its users. We believe in fast and secure messaging that is also 100 percent free. Commercial companies frequently face the need to compromise their values for financial gain. This is why we made Telegram a non-commercial project. Telegram is not intended to bring revenue, it will never sell ads or accept outside investment. It also cannot be sold. We’re not building a “user base”, we are building a messenger for the people. Pavel Durov, who shares our vision, supplied Telegram with a generous donation through his Digital Fortress fund, so we have quite enough money for the time being. If Telegram runs out, we’ll invite our users to donate or add non-essential paid options. TechCrunch reported that the app had 100,000 daily active users in late October 2013, no further update has been shared since then. To be clear, though a promising start for Telegram, this is not an immediate threat to WhatsApp. The company adds over one million new sign-ups per day, and losing 500,000 users to Telegram — assuming that they all came from WhatsApp — would represent a mere 0.1 percent of its total active user base. 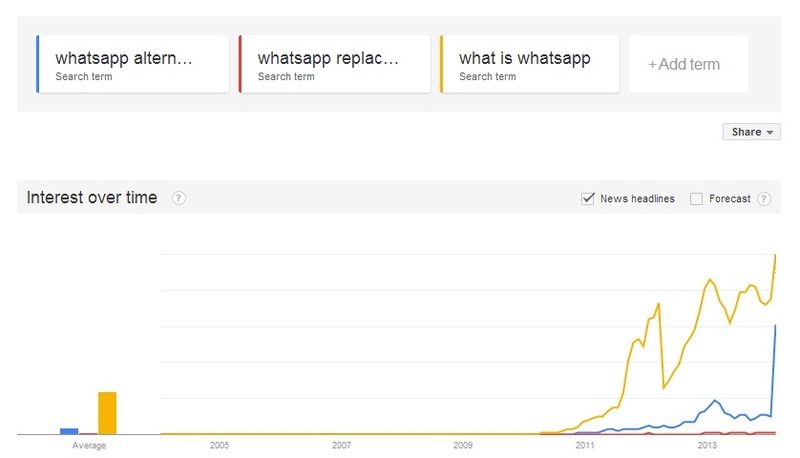 WhatsApp appears to have gotten a good reception from its users, with few sightings of user protests and little evidence of large scale fleeing. It seems that most fully believe the company and Facebook when they say things won’t change, or simply aren’t interested in switching to a rival service.